May 11, 2014 – There’s no “creationism vs. evolution” debate in the world of whisky. Great whisky makers create their whiskies and evolve over time, and that’s the case as Forty Creek’s John Hall prepares to unleash his newest creation this fall. Forty Creek Evolution is the latest in Forty Creek’s annual series of limited edition bottlings, and while it is the oldest whisky Forty Creek has ever released, it will not carry an age statement. 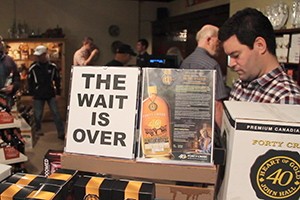 Hall described the unique process for Evolution in a WhiskyCast interview. Hall picked the name Evolution because the flavor evolves over time, and because Forty Creek is going through its own evolution right now. The deal announced earlier this year in which Gruppo Campari will acquire Forty Creek for $185.6 million CDN ($166.7 million USD) is expected to be completed on June 2. Hall will continue as Chairman and continue to oversee Forty Creek’s whiskies after the deal closes, with Campari expected to invest in additional production and distribution capacity. “Right up until now, I’ve only been able to sell Forty Creek in Canada and the US just because of my limited resources, where as now we’ll be able to take it further to other countries,” Hall said. While the initial focus will remain on developing nationwide distribution in Canada and the US, Hall suggests Australia and Brazil might be the first new markets for Forty Creek, though he stressed that a final decision has not been made. As in previous years, Evolution will be released during Forty Creek’s annual release weekend at the distillery in Grimsby, Ontario on September 27 and 28. Approximately 9,000 numbered bottles will be available to reserve through the distillery’s web site starting at noon EDT on May 21, with consumers able to reserve the numbered bottle of their choice for pickup in September at the distillery. Bottles #1 and #2 will remain in John Hall’s collection, but numbers beginning with #3 will be available on a first-come, first-served basis. Editor’s note: This story was updated on May 13 following an interview with John Hall.